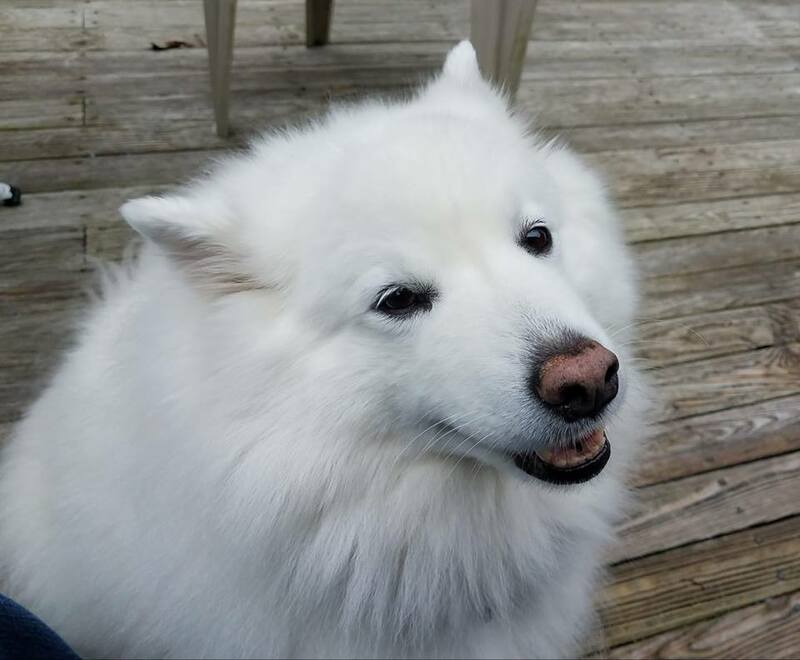 When one of my 2 Sams passed a few years ago and the other aging I could not stand the thought of not having a Samoyed in my life. I also wanted my remaining Samoyed to have a companion. I searched and searched for another and was hoping to find one to rescue. 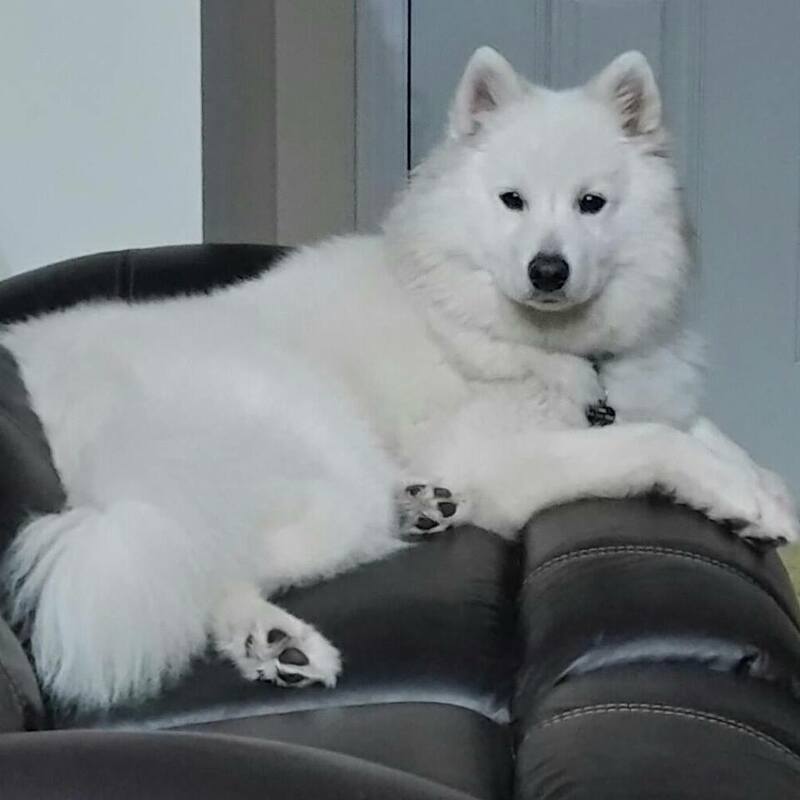 I decided to put an ad in an online classified "Wanted Samoyed". Yvette answered that ad and called me to tell me about Sams in Korea. She sent me pictures of Sams that might interest me and one caught my eye. "Tanner". After a few delays getting him on a plane to the USA he was finally shipped cargo to Salt Lake City. Tanner arrived a little scared but quickly snapped out of that as soon as I got him home. He has become such a great member of the family. He loves to play with his sister Keeley (another Y-not Save a Sam Rescue that I will talk about in another success story) and give hugs. And I do mean hug, every morning I get my coffee and go downstairs to my office where I will hear Tanner wake up and come running downstairs where he throws his paws around me and gives me a long hug. At night he does the same when I go to bed. When I sit down in the chair with the ottoman he always backs up to my feet and sits down for his back rub. He never licks but loves to give nose bumps. He also loves to watch Avatar and Eight Below. 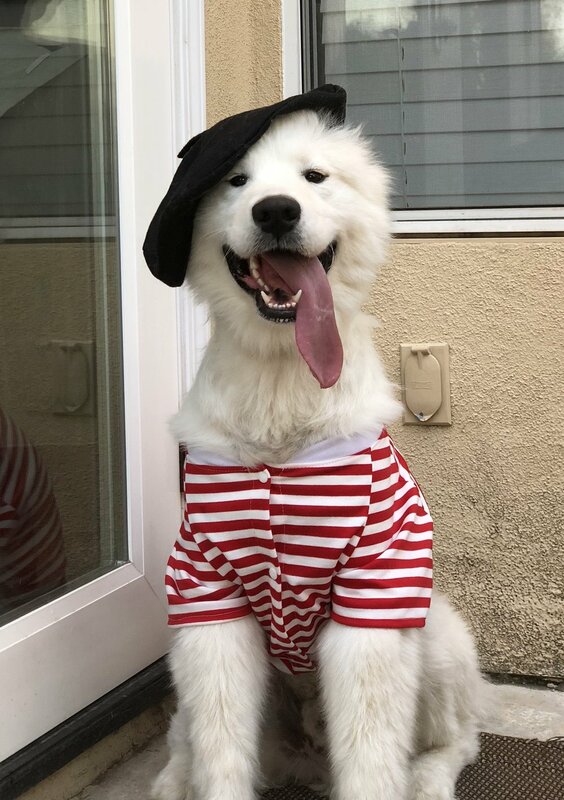 He is very smart and has learned full sentence commands and hand signals. I love him so much. He is truly my best friend!! We fell in love with Markus (fka Solar) on the Empathy For Life (EFL - Korea) website. We initially contacted Yvette because we saw that she had been coordinating rescues with EFL to the US and wanted to gather some information. She was super helpful and encouraging! She not only helped us understand the adoption process but also let us know what to expect from rescue dogs. After we submitted our application, there was some concern about how Markus would do with other dogs and potentially children. He had been at the shelter for over a year and his only exposure were to other dogs there, so there was a lot of hesitation in bringing him over. Yvette believed in Markus and in us, and she spoke to the rescue shelter for us, going as far as being the guarantor for the adoption. After much discussion, we were finally approved to adopt Markus! Yvette arranged for the flight and we were able to form our family with Markus. Yvette continued to be available for any of our questions and concerns, giving us tips and supporting us through getting Markus settled into his new life. He has come a long way, and has since made lots of friends - doggies and humans alike! He has been such a blessing in our lives and is such a sweet dog. We are so grateful to Yvette for her loving heart! Masha became a part of the family so quickly and we cannot believe how lucky we are! She is so fun and playful, but also incredibly gentle and patient. 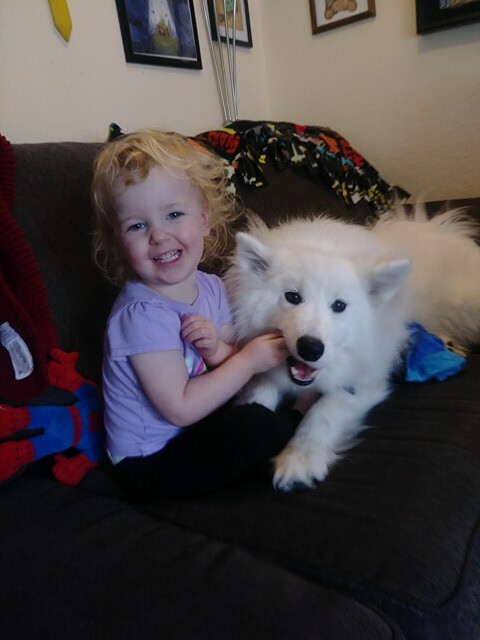 She does great with our 2yr old daughter, loves cuddling with our son (and us of course) and she has a great time playing with our cat (the cat likes the attention as well!). We really can't thank you enough for letting us provide a forever home to this wonderful pup! I've attached some images of our family, feel free to use them in a post. Thank you again for what you do! My partner and I were living in Seattle when a friend of mine contacted me to see if I would be interested in fostering. She explained that they’re coming from S. Korea, and at first, I was leaning NO, but I started to think about it and decided to foster. I contacted Yvette and asked how I could help. The next thing I know I was picking two beautiful Samoyed’s up at the airport. We fostered a beautiful male named Bodhi. Bodhi was frightened of the world when he came to our house, but he was extremely handsome and gentle, so within a week we’re in love with him. When the first family came for an onsite visit to see Bodhi and learn more about him, I knew he was our dog. There was no way we could allow Bodhi to go to another home because he was home. I sent an email out to Yvette that day letting her know we wanted to adopt Bodhi ourselves. I’m sure the other family would have given him a beautiful life, but we knew, and Bodhi knew he was already home. Bodhi has certainly given us our challenges. Since he was afraid of everything and everyone he would dash for a door when it opens to escape. Our house was covered in dogie gates and signs up for anyone visiting to be careful when opening the doors. Each day we’ve had Bodhi he becomes closer and closer to us, and we no longer have dogie gates or signs up. Bodhi now stays when we open a door when told, and I’m not sure who’s more excited to see whom when we come home from being out. Bodhi, will jump straight up in the air with excitement and always has the hugest smile on his face to greet us. This makes our entire day!!! Adopting a rescue takes a lot of work but it’s worth every minute and energy one puts into it, and the love you receive back is overwhelming. It's been almost a year since we adopted Loki. He’s very playful around other dogs and just loves to play! We love him. He is well behaved although the stubborn Jindo comes out sometimes especially when chasing squirrels. He loves going on walks with anyone who will take him outdoors - boy can he run fast! He enjoys going to the dog park to play with other dogs and make new friends. He has been wonderful with my family and coworkers. His best playmate is my coworker’s husky. Loki is still a lover and loves anyone who pets him. I am amazed the dog has fur on his body because he wants to be petted 24/7. This has been a wonderful experience. Loki has added a great deal of joy to our lives, and I have to thank Danielle and the good folks at www.saveasam.org for helping me rescue young Loki. I will certainly look no further when its time for Loki to have a new friend. This little Boy Mikey (Now Bodie) was in such horrible condition. He suffered from Distemper, Mange, Pneumonia and extreme weight loss. It was due to these great Woman that our beautiful boy survived. They stored him with 3 other Samoyeds and 1 Chow in the basement of a Pet Shop to hide them in China. They were not sure Bodie could travel since he was almost near death. Yet Sonya, Yvette and Danielle did not give up on this happy sweet boy. They were determined to give this Boy a wonderful life in the US. When our Bodie arrived in the US, Yvette made sure Bodie was healthy and Happy. Bodie got his teeth done, his mange treated, and his weight up. Most importantly, he was given such love by Yvette, Russ and their granddaughter, Bridgee. Thank you! Because if this, Bodie started to blossom. Bodie is one of the sweetest dogs I have ever owned. He is so gentle and happy. 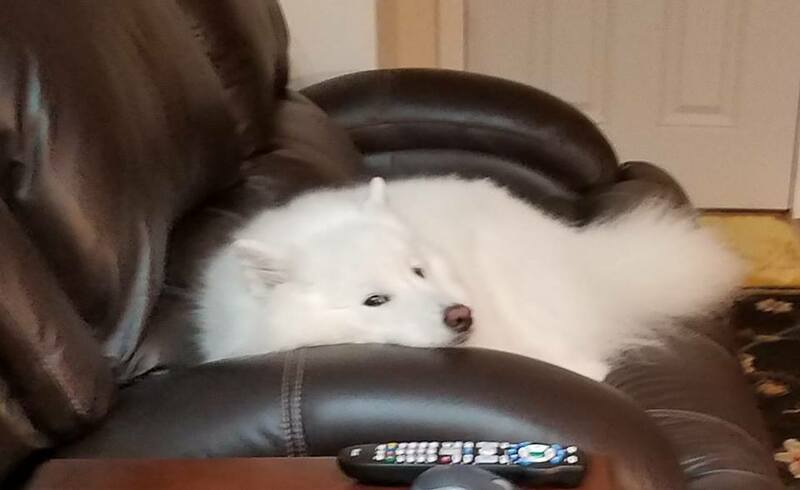 He loves his comfortable Dog beds, being by your side just watching TV, and playing with our 3 Samoyeds. Yvette even gave us some of Bodie’s toys, bed and oils to help him through thunderstorms. He is afraid of loud noises, but is okay when you wrap your arms around him and show him love. He is a big fluffy teddy bear! His eyes are so stunning. Beautiful inside and out! Thank you Yvette for our beautiful Bodie Bear. Bella, Skya and Pasha have their new little brother and couldn’t be happier. He loves to play tug a war with Pasha and looks up to his big Sister Skya. He loves to watch our Bella chase squirrels. He even loves our cat cuddles! Gentle sweet wonderful boy! He is a gift from God. Yvette, Sonya, and Danielle saved our little Boy. For this we are eternally grateful! We adopted Adalind (FKA Lindy Loo) a year ago and just celebrated her birthday (her official adoption date!). When she first came to us, she had had a bad skin condition and had her hair shaved in various spots; she was sweet but timid and wasn't quite sure what playing was. A year later, she is the silliest little girl who loves hopping around at the park, saying hello to other dogs, and taking herself on walks. 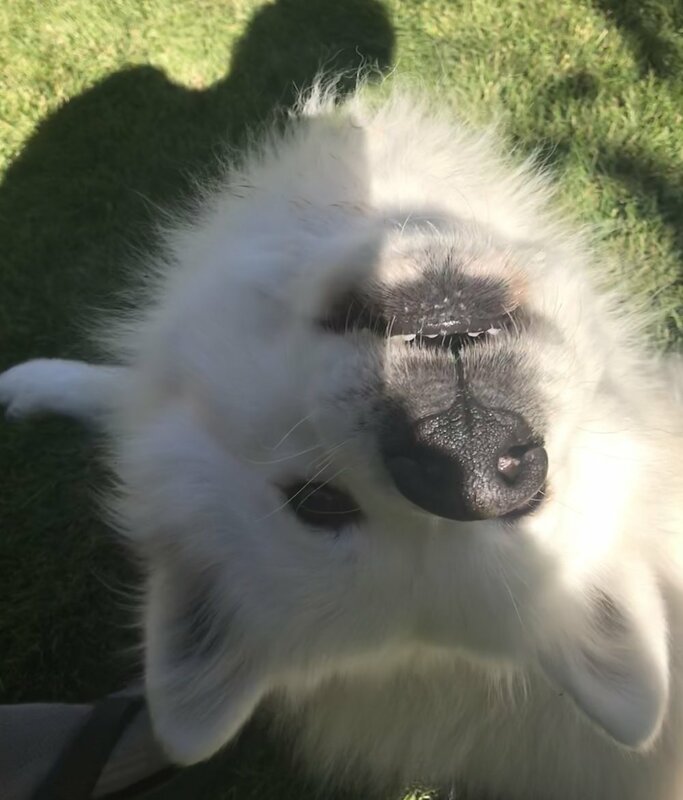 She makes the funniest growling noises like Chewbacca and spends her day napping and plotting with her Samoyed sister, Ella -- they are two peas in a pod. Adalind is the sweetest girl and has brought so much joy to our lives. She is well loved by everyone in our family! We get many requests to bring her over and have surprise visits at home (that are really for her, not for us). We had a great experience working with Yvette and Y-Not Save A Sam Rescue. Thank you for helping us find our Adalind! Baymax, AKA Wyatt was a search months or longer in the making. I moved to Idaho from Colorado to take a job. 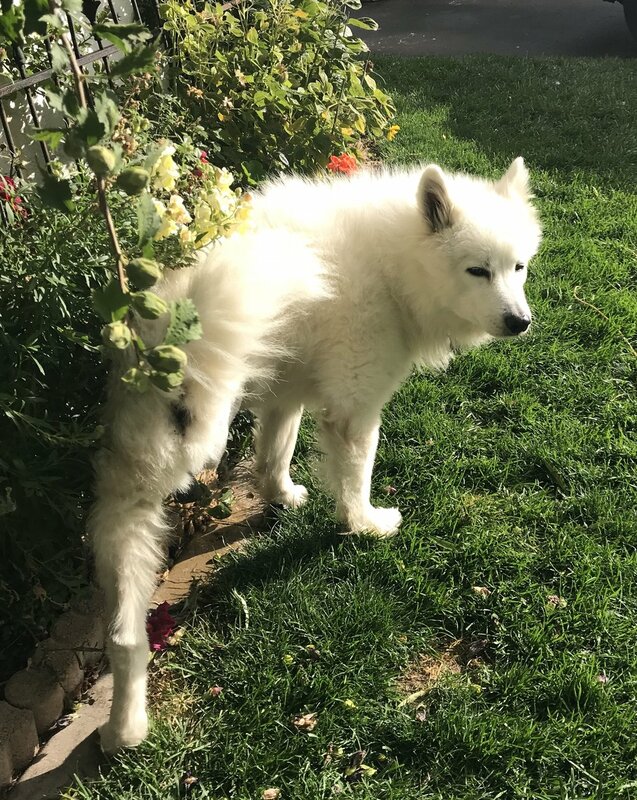 I knew I had just finished having a house built and knew that, after years of absence, I wanted another Samoyed, I had a Samoyed growing up and he passed away two weeks after I completed my master degree. Life up to this point had not afforded me the luxury of replacing my first dog, but at long last, I was able to begin the search. I reach out to breeders, searched shelters, and asked lots of questions from many people. Finally, I had heard about Y-not and Yvette. I checked out her website, skeptical because my hopes had been dashed so many times before. But I saw some wonderful rescues, and amazing stories. A rescue seemed like the best thing to do. I wanted to give a dog a forever home. 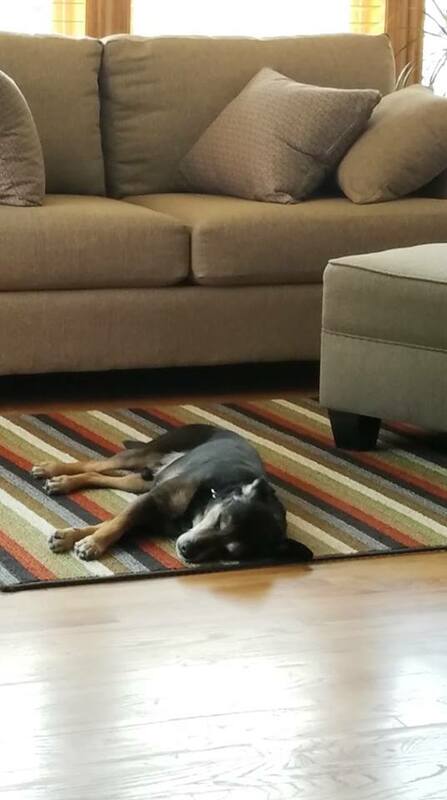 My grandmother fostered and I was familiar with the pro and con of adopting a rescue. Still, I decided to look further into it and contacted Yvette. I was so lucky to be able to get the paperwork filled out and drive to Logan to meet Wyatt, now Baymax. He had quite a story coming from S, Korea. But it wasn’t over yet. It was just beginning. Beginning to get better. 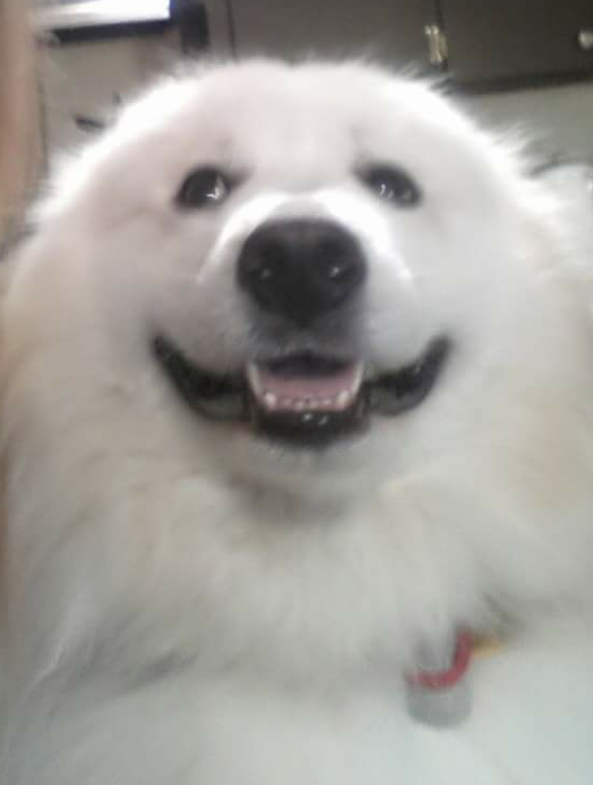 Baymax is a happy, very happy, loving dog. He gets along with everyone he meets. He loves car rides, going to the D-O-G P-A-R-K, pets, belly rubs, children, other dogs, and is chew toys. Yvette gave him a red dinosaur toy on the day I picked Baymax up and drove him home. He was so well behaved in the car. Even though it was a four+ hour drive home back to Caldwell. 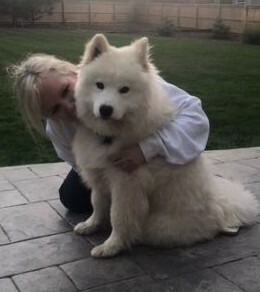 Baymax is very well trained, He knows “sit” “balalala” (shake) and hugs. He’s always in character. He won’t leave until you tell him you are satisfied with your level of care. 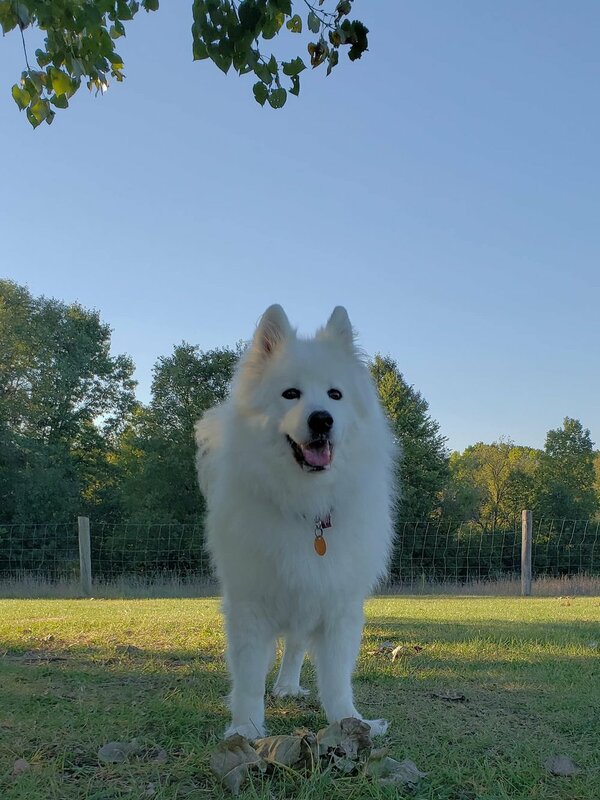 Baymax has gotten used to a walk every morning with breakfast, a doggy dental treat, and a walk in the evening with dinner, followed by the night night walk. He gets to cuddle in bed as part of the go night night routine and has his own bed full of toys where he can pick and chew whatever he wants. Although he still prefers a good book. Baymax used to be able to go to work with me and would sit under my desk at work. But he is also happy laying at home on the floor. He also loves going to the neighbors house and playing with their cats. They are just small friends with strange barks. Baymax travels well with me a lot. I have to travel a lot with work across the country. Baymax has been in hotels from Washington to Florida and has quite a following wherever he goes. People want to pet the fluffy cloud. He loves a regular trip to the doggy spa to get his nails clipped and a good blow out, but his favorite thing to do is simply spend a few hours running around the dogs park or driving down the road with his head out the window. He thoroughly loved the long car rides driving across country going to Florida. He also loves going and getting a pubachino at Starbucks or a pup cup at Freddy’s. Today, Baymax has settled in with me in Orlando. Baymax loves mornings on the balcony, walks, and has discovered the fun of going to the beach, (although he doesn’t much care for the salt water in his eyes). He hasn’t made it to Disney World yet, but he plans to go for an event Disney is hosting to help raise money for the local animal shelter in November. To be honest, Baymax may have a magical life now filled with travels and adventures, and I do love this dog. But, as so many others have said, this dog’s story is as much a story of rescuing his human as it is a human rescuing a dog. Baymax has a forever home here, with me, and although the locale has changed, Baymax will always be with me. The first time I ever set eyes on Samoyeds in a sled dog race, I knew it was the breed I wanted someday. Well the time came 15+ years later when I decided I was ready to take on the responsibility of caring for a dog. As I realized it was time, I obsessively Google searched for Samoyed rescues and there never seemed to be any dogs available. I finally stumbled upon SaveaSam.org, read all of the incredible success stories, proceeded to find Save A Sam on Facebook and communicated with Yvette. She encouraged me to apply. It’s become history ever since. Yvette worked her magic to make sure Kimba (AKA Jacob) was in great hands the entire way from S. Korea to Las Vegas to Utah and finally to me in Colorado. I was nervous to learn upon his arrival in the US that Kimba’s fur was so severely matted he had to be completely shaven. Otherwise, Kimba was super healthy, happy and well taken care of. With or without his full body hair, he gained so much love and attention from nearly every passerby! I didn’t know a dog could draw so much loving attention. I must say thanks to Yvette and everyone else involved in the process! I’ve been blessed with the most amazing dog for me! Kimba is such a gem. He’s a sweet soul who is incredibly gentle, loving and playful with all dogs and people. He’s thriving and becoming more confident, loyal and loving every day. His curiosity, playfulness, puppy gallop and light hearted behavior bring a smile and excitement to me every moment. Kimba is exploring life, meeting every dog, chasing every bunny, gallivanting on the endless trails and visiting every possible dog park. His coat is growing in fast and he’s now the softest puppy I’ve ever felt. As a first time dog owner, Yvette sent us off with everything we needed to keep Kimba happy on the rest of the adventure back to Colorado and beyond. She helped make the transition easy and is eager to provide guidance when I have questions about what’s best for their breed. I highly recommend Yvette and SaveaSam.org to anyone wanting to bring the best breed and the best dog friend into their family. We had just lost our 15 1/2 year old "Princess" (Sammie/Chow) less than 13 months before....and our kids began we on us for another member of the family....Despite not being fully ready...I put on those "parent shoes" and logged online coming across Y-Not Save a Sam Rescue. We inquired and since we are in California, we spoke with Danielle who honestly went above and beyond to make the process as smooth as possible! When meeting Spirit, you can tell the love, passion and dedication that Y-Not Save a Sam puts towards their rescues! Spirit has fit right into our family, and is the perfect match! He is enjoying his daily walks, car trips, multiple treats and soaking up all the love he gets! We are so grateful for Danielle and Yvette with Y-Not Save a Sam Rescue. They are both WONDERFUL to work with and are both Saints!! Thank you from our hearts for helping to create a lifetime of memories!! Koda (Ramsey) came to live with us from South Korea in September 2017 . He was a very skinny gentle boy with sad dull eyes. 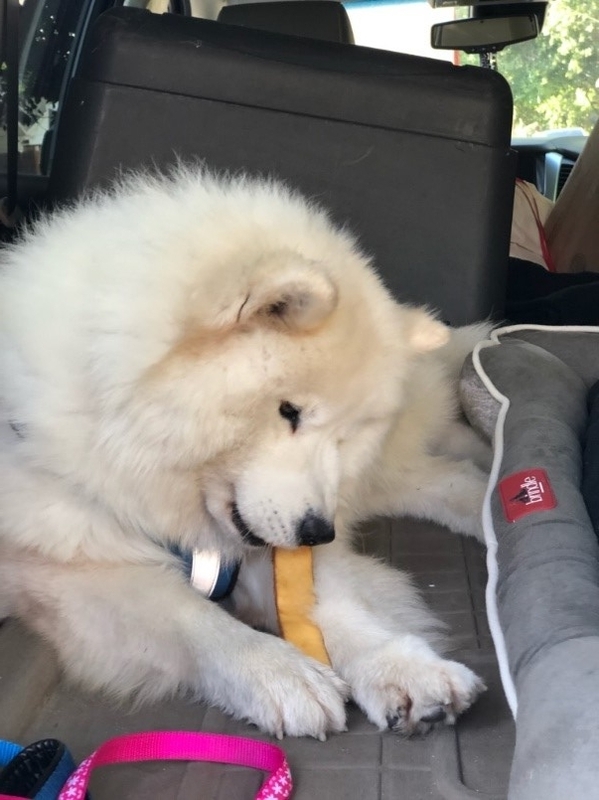 He was extremely food motivated, liked to hoard toys and had scared our four year old female Samoyed Jaeda. After an adjustment period in which he excavated the flower beds, shredded a few pillows, and dug a few craters, he has become a well-adjusted member of our family. Koda is a very gentle with young children and elderly adults. He is a happy, confident boy who has learned to share and play with his older sister Jaeda. He is still very good motivated, loves his walks and looks for cuddle time. Koda and Jaeda have become best friends and are very protective of one another. Koda has enriched our lives more than I could have imagined. He is a kind, loving boy who just needed a chance. 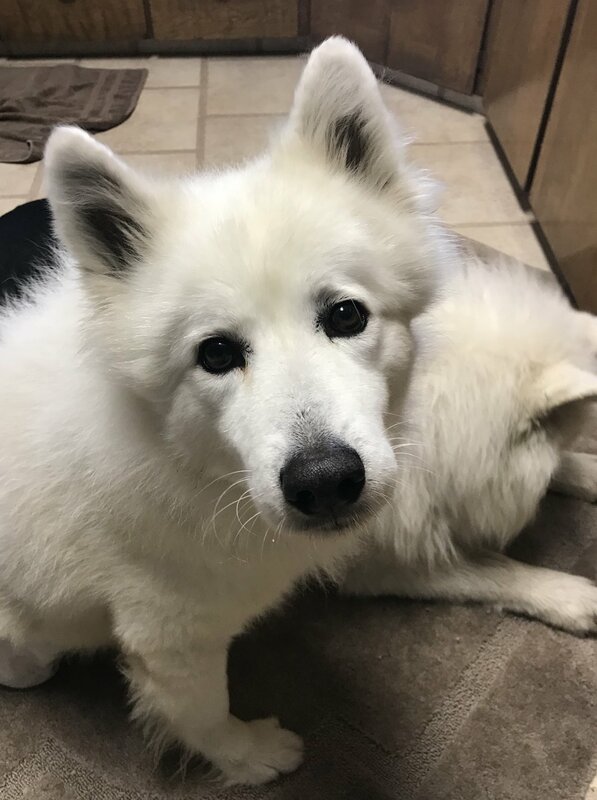 Kimmi was owner surrendered in South Korea in the fall of 2016, about the time that I was saying goodbye to my last Sammy, Charlie who died at 14. Fortunately for everyone, Kimmi was placed in the care of Y-Not Save A Sam rescue and was waiting for a home. 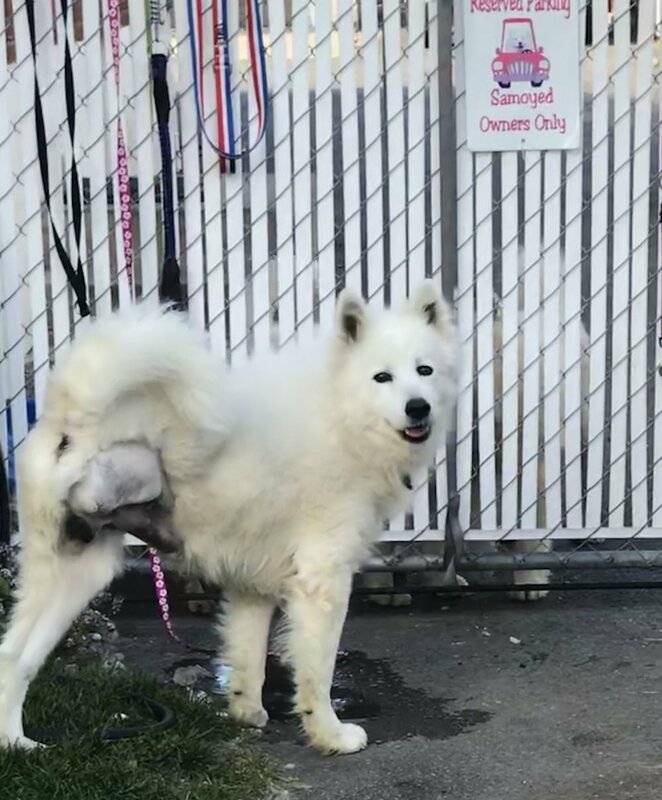 Knowing that no home is complete without a dog (especially a Sam) and that I was probably in for a long wait to get a rescue, I contacted Yvette, who I knew from Facebook was rescuing Samoyeds from South Korea and asked about getting on a waiting list. I filled out the application and Yvette contacted me about Kimmi. I saw pictures and fell in love and 3 weeks later was driving up to JFK with my best friend to pick her up and spent the trip home with Kimmi curled up in my lap asleep. What a sweetheart she is! She is happy, loving, affectionate, intelligent, beautiful and always mischievous. On her first morning in America she had mastered sit, down and come in English and decided that she needed a new name (she was called Mia when I got her). On the other hand, Kimmi should have probably been named Houdini as she is an amazing escape artist, looked for any weaknesses in the fence and when they were fixed she figured out how to open the gates which now have locks on them. Fortunately she stayed close to home when she got out and was very easy to find. I strongly suspect that she started her life as an apartment diva who was used to puppy pads because it took a while to convince her that she was supposed to go outside not inside on the mats. A year and a quarter to be exact. The first time she stepped in the snow, she turned the tightest circle to go back inside but soon learned about the joy of jumping and running in the cold wet stuff. She is an incredible herder as I found out at the dog park as she attempts to move the other dogs to where she wants them to go but didn’t work so well with the skunk she met this summer. Strangers aren’t strangers but friends she hasn’t met yet so she’s not a watchdog but I wasn’t looking for one anyways. I am forever grateful to Yvette and Y Not Save A Sam for finding me my best girl. Hi I’m Bear (like a Teddy Bear). I was surrendered to Yvette by my owners who were hiding me in an apartment that I wasn’t supposed to be in. My previous owners just showed up with me in an ill-fitting crate and asked if Yvette would take me. I’m not white or fluffy and I’m not even sure how old I am, but regardless Yvette didn’t want me to be dumped somewhere, so she took me into the herd. I was with her and the Sammy’s for about 2 weeks before my new family saw pictures of me. Yvette sent me on a sleepover and I never came back. At first I was a little timid and didn’t really play with any toys. Now that I have been with my forever family for a few months, I will chase a ball and return it sometimes, chew the squeaker out of my toys, and gnaw on a good chew stick. I love to lay on the couch with my humans and get my belly rubbed. I rarely bark except to protect the yard from Deer that come to eat the apples. The youngest members of the family love to take me on walks and love when I chase them around the yard. I came to my family with a few issues, but being that I am such a good boy we are figuring them out. I’m trying to teach my new mom my language, but she seems to be a slow learner. Thankfully there is always Yvette to fall back on with any questions on my weird behavior. I am adjusting well and love my new home without a kennel that is too small. If Yvette hadn’t been willing to take me in and give me a chance, I don’t know where I would have ended up. Thanks Yvette (and family) for taking me in and seeing that I found a new home with a forever family (even if they are a bit crazy). We are grateful to Yvette for the tireless work she does on behalf of dogs halfway across the world and in her own neighborhood. She can’t save them all, but she would if she could. Before Jace, I had a one girl wolfpack, Diva. She always loved playing with bigger dogs at the park, and I really wanted her to have a brother. When I first saw Jace come up on the Y Not Save a Sam rescue page, I instantly had a yearning for this precious boy. He was going to come with a lot of hardship. His fur was matted, his back leg was infected and was going to need to be removed. But watching him day after day, seeing his personality and how sweet he was, I just knew I wanted him in my family. I talked to his foster Mom, and Yvette over months, checking in on him, hoping that I could make him Diva's brother. I finally got the call from Yvette, Jace was cleared to fly to Chicago, and he would be joining my family! It was a long drive home, but it gave us a great chance to get to know each other. Then the true test came...meeting Diva. I put Jace in the back yard and brought her around the front of the house to meet him through the fence. She sniffed him, she wagged her tail in excitement and confusion. She didn't bark at him one time. I let her in the back yard and she did what I never saw coming...she flopped on her back and pawed at him like she wanted to play. It was as if she knew, he was there to be the brother that she always wanted. We had a welcome party for Jace, friends brought their dogs, and people friends brought gifts (toys, treats, blankets) for him. We opened each present and he sniffed all of them. We were standing in a circle, and Jace was in the middle. The most awe inspiring thing happened. He started talking, looking around the circle at everyone, almost as if he was saying thank you, thank you everyone for being my new friends. People were speechless, people started to cry. It was this moment that he knew he was home. 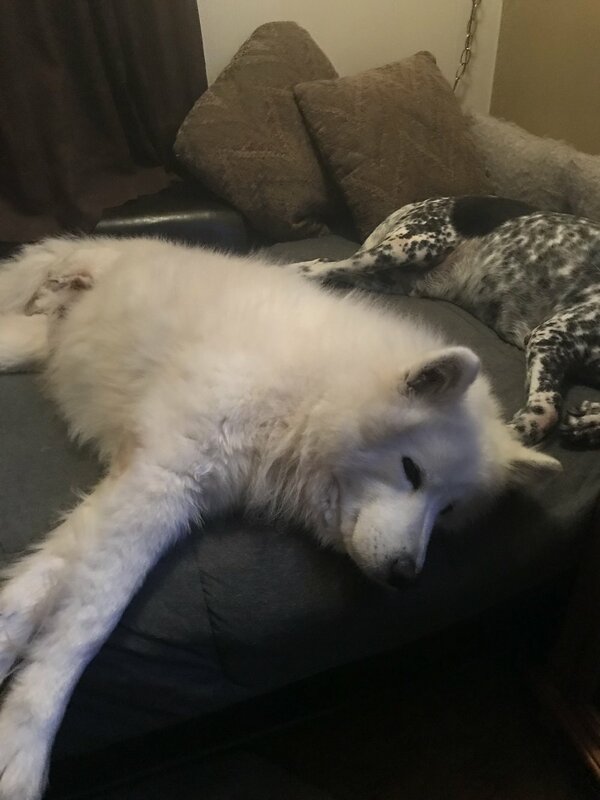 It has been a long process, strengthening Jace's single back leg, but the best therapy for him was his energetic sister Diva, Diva would get down on the floor to his level and play. She would play bark, she would let him steal the toy, she would play tug of war...all things that amazed me. She is so gentle with him. She would run around him in the back yard and let him chase her. She would flop on her back and let him get on top of her. Jace and Diva, now brother and sister for 7 months make up the Lynch Wolfpack. Jace is still making progress. He can go up the back steps all by himself. He runs down the stairs in the house every morning. He is so strong now, challenging Diva in real tug of war battles with their ropes. Jace can run...he can run in the park! The two goons go on many adventures, whether it be Bark at the Park, helping watch an RV while I managed a 2 day music festival, or going on mini road trips, these two are incredible. Jace's personality took a while to come out. He was very quiet. He would just watch everything I do. He gives the most kisses...he likes to talk, and is very sassy. Jace loves to watch TV. Sometimes Jace will leave a bite of food for Diva in his bowl. Everybody loves the Lynch Wolfpack, two bumbling siblings who are the brightest parts of my day. This guy strutted into our hearts in April of this year and our lives in May. He is a hairy little beast and looks like a giant snowball flying around my house, but in his calm moments, he flips on his back and awaits a tummy rub or just a nice snuggle. His past (or morel like what I think his past might have been like) doesn’t seem to impact him or perhaps it shaped him more than I know. But this gentle giant (okay, unless he sees a squirrel, then he is an all-out train running off its track, regardless of what I say or do) has fit right into our home and become our little love. 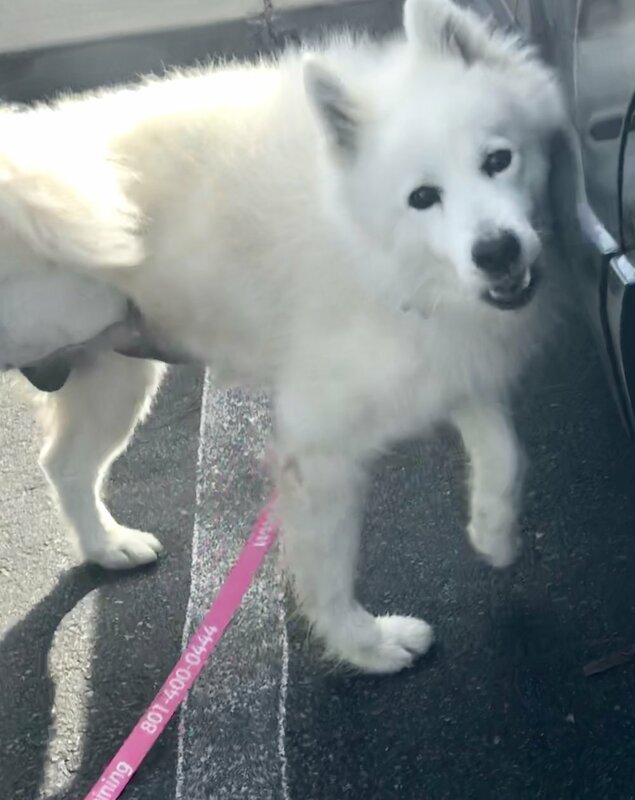 “Tate” was listed on a site called “Y-Not Save a Sam” and it was when I googled “Samoyeds,” that I happened upon this site and promptly reached out to Yvette about Tate’s picture. 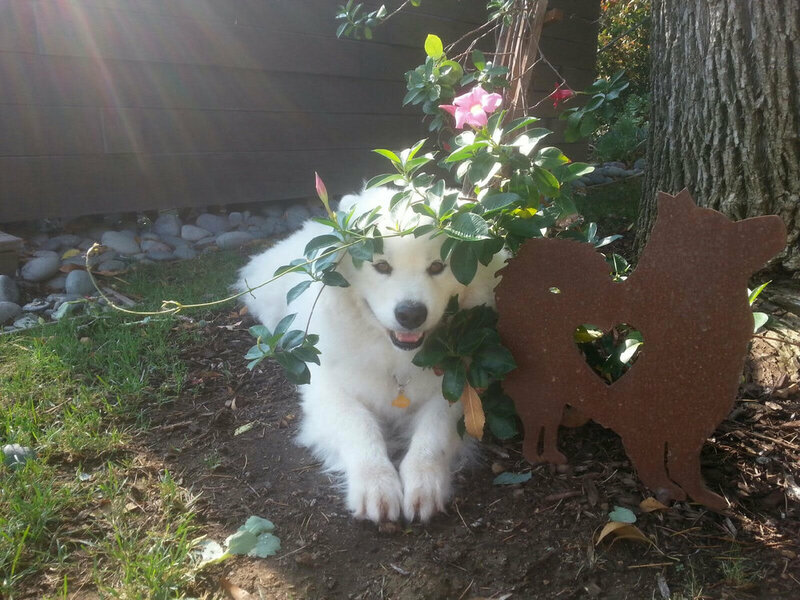 We had been looking for a Samoyed for a couple of months. 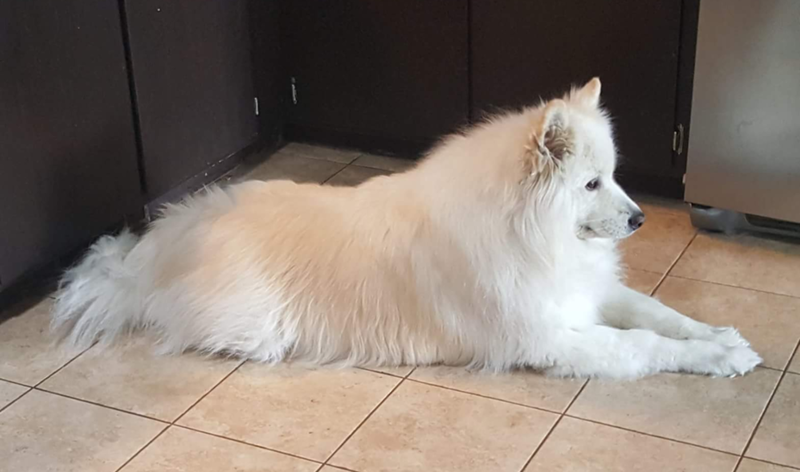 We have had 2 previous Samoyeds, but it had been 12 years since we had a dog and we really wanted a rescue, not a puppy. So, in reading through her site I couldn’t believe it, not only were they rescued, but they were rescued from South Korea!!! (and China, but Tate is a Korean) We have 2 kiddos from S. Korea, so we really felt like this was a match made in heaven. Luckily for us, Tate was still available and we were able to make a match! Tate flew to us and Yvette did as well, so we could meet her and our new pup at the same time! She brought everything he possibly needed…including love! What an amazing human she is… and what an amazing pup Tate is! Yvette thank you for your organization and all that you do for these dogs and thank you from Tate…we are all grateful to have “each” other! A new chapter of our lives started when we had to relocated to the US for work. With the start of our new chapter it was also time to increase size our family :) Some hoped for a baby (mom) but no we wanted a dog. 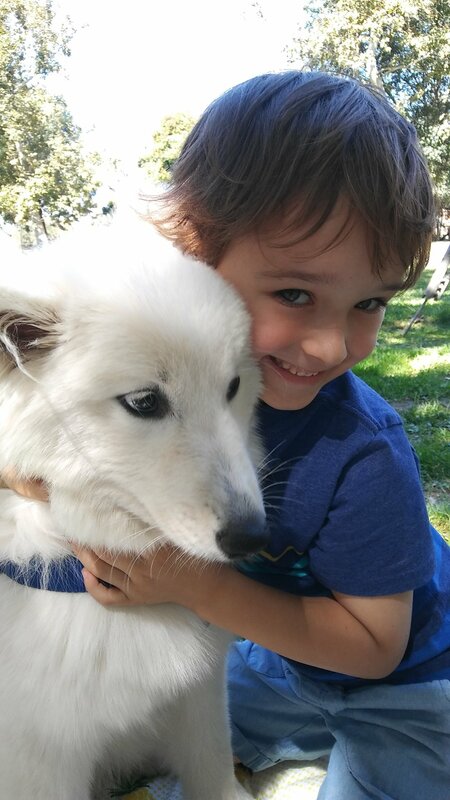 We met a beautiful Samoyed on the farmers market and fell in love. At that moment we knew that we wanted a Samoyed after a lot of research we found the breed to fit our family perfect. Now the challenge started where do we get a Samoyed? 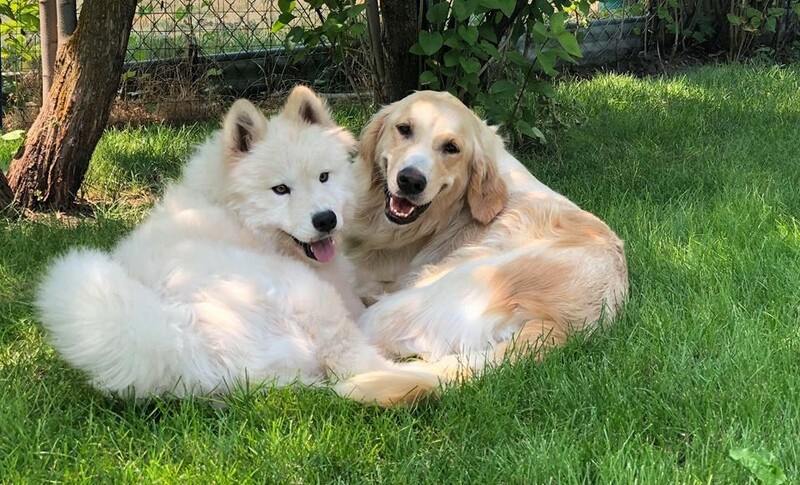 We preferred rescue but if not possible, a puppy would be great, however there were no Samoyed available in the whole Oregon. 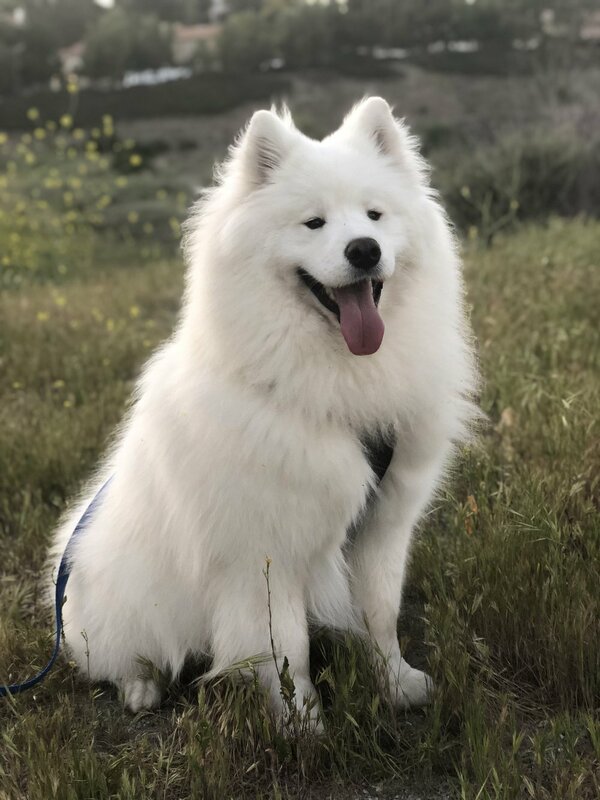 After a lot of online checking we do found a lot of Samoyed's in California, unfortunately all the place who had one did not do out of state adoptions. The only thing now we could do was keep an eye on the breeders in Oregon and hope they get a nest. We quickly filled in the adoption forms and then the waiting started, we were not sure when new rescue would come over and how much people are in front of us. Within two weeks we got a message from Yvette that two puppies (Jett, Jason) would come over from S-Korea to LA and if we were interested. Suddenly we became the most happy people on the earth, we said Yes and agreed on all the terms. We booked our flight from Portland to San Jose. First few weeks Jason stayed with Heather, Heather you are an Angel!, and got a new name -> Popcorn. He had an amazing time with Heather and got so much love! It was love at first sight! We knew he was going to be it :) That night we stayed in the hotel in San Jose and the next day we started our 2 day road trip back up to Portland area. Half way we went to crater lake and we found out that Popcorn now named Bourbon loves snow. When he sees snow he becomes the happiest dog on earth! And family photo of us at crate lake. After a week we knew for sure we are keeping him :) He was doing super good and love to meet and play with all other dogs :) Even though he was white he sometimes wanted to be brown, love digging in the dirt face first. 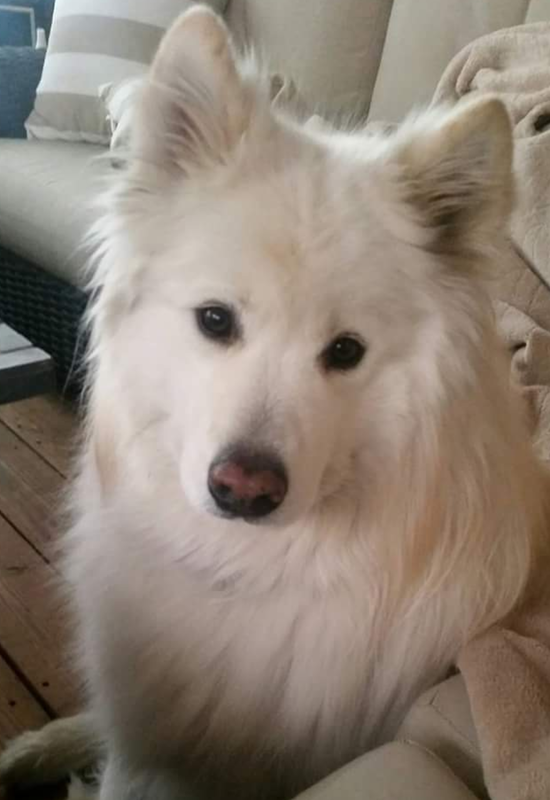 He grew up very quickly and seemed not to look like a Samoyed so to settle our curiosity we did a DNA test at the vet. The results were pretty interesting, Bourbon was 50% Jindo, 25% Samoyed and 25% Akita :) This seems to be a golden mix as he became a beautiful, cool looking guy! (the girls [dog and human] love him). 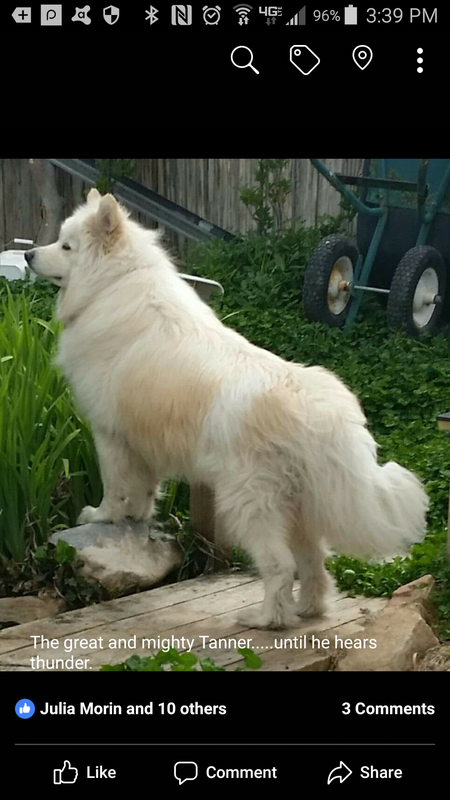 Even though he looks like an Artic fox he has an amazing behavior. He is very calm (here and there a bit shy), curious, relaxed boy! We couldn't wish for anything else, he made our Ying and Yang. We can't thank Yvette and her Angeles, Heather and Danielle enough! They gave us with the best thing that could happen to us!" We met a woman at the local dog park who had a beautiful Sammy. We asked where her dog came from and she told us about Y-Not Save a Sam. We immediately went to the website and applied to be a foster, hoping that we would meet a dog we would eventually want to adopt. Yvette called us one day asking us to meet her at LAX and that’s when we got to take home our amazing dog Bentley, who was a home run for us. Bentley (formerly Indy) was found at a shelter in Korea on July 4th, 2017. When he arrived, our family was so excited to have him here that we immediately took him to all our favorite spots in town to show him around his new home. We didn’t realize how underweight and weak he was until he fell asleep in the car and couldn’t get out at our last stop. His coat was so tangled that all the groomers recommended shaving him but we refused, spending days working out the knots in his coat. Ben patiently sat there and observed everything with a calm and friendly demeanor. He was so polite, refusing to jump on furniture and not barking. He was a bit on the shy side and unsure of loud noises. Now, Ben is fully grown, healthy floofball that loves his treats. He naps a lot but when he’s awake, he prances around like a show dog. Everyone he walks by insists on loving on him and it’s obvious from Ben’s face that all he wants to do is make people happy. We get a lot of joy from seeing the joy he brings to others. He always accepts adoration and pets, even rolling over for a belly rub from complete strangers. He loves playing with his squeaky toys and is good at going to the store and picking out a toy to take home. He loves fetching balls at the baseball fields, chasing squirrels at the dog park and running around the dog beach. 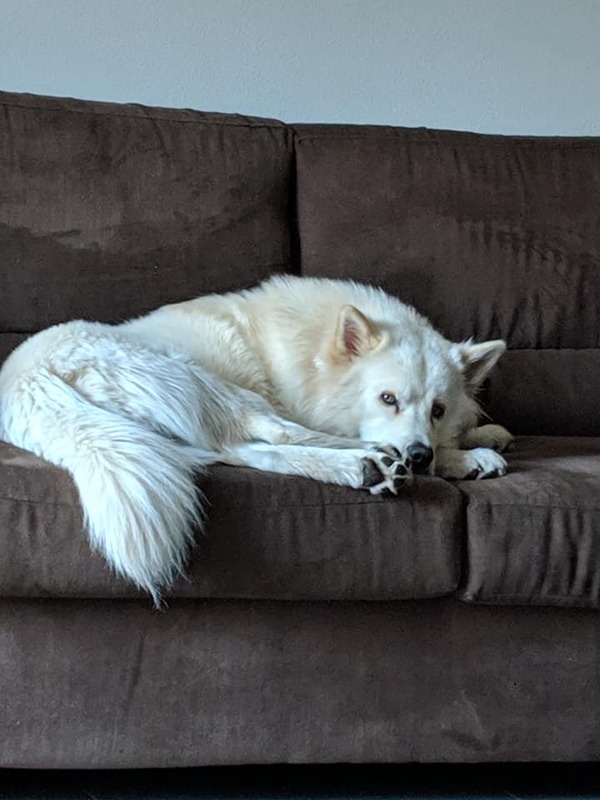 He has even started jumping up on the couch to cuddle and lets out a low, tiny “awoo” when he’s welcoming someone to the house. Bentley is one of the friendliest, calmest, and happiest dogs we’ve ever had. It’s so easy to take him out in public because he’s so calm and gentle. We love to tell everyone that we got him from Y-Not-Save a Sam. He’s a great example of an amazing dog you can get through rescue! Lucky is our second Sammy adoption from Y-Not Save a Sam. Our other Sammy, Bentley, is a happy, calm, boy and we wanted a buddy for him. We applied to foster one of the dogs coming in from South Korea and we were very fortunate to get to take Lucky home with us. 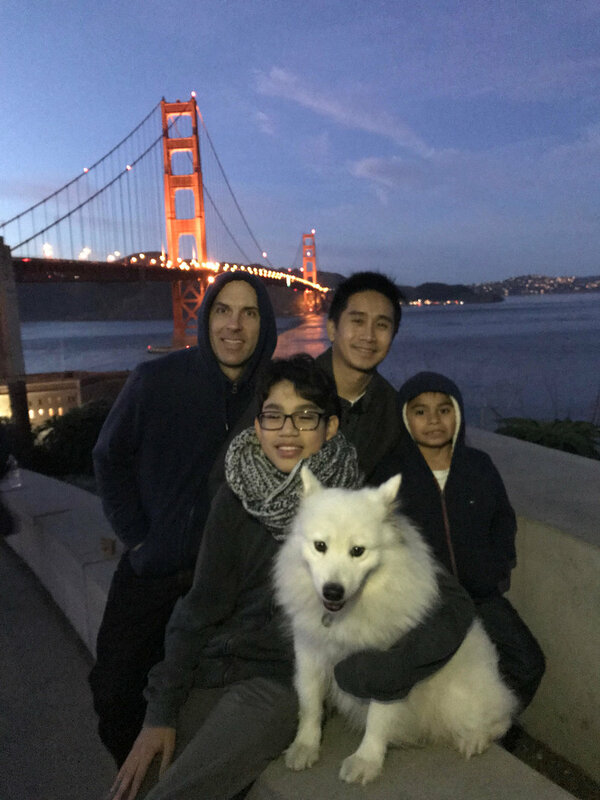 Lucky was named by Anthony, the amazing kid of another Sammy owner and enthusiast. Anthony fundraised for Y-Not Save a Sam for his birthday and as a thanks, he got to name the dog that would eventually be ours! Anthony and his family met us at LAX to welcome Lucky and we will never forget watching Lucky and Anthony bond by shaking hands over and over again. Lucky is the yin to Ben’s yang - Ben is polite and reserved whereas Lucky lets it all hang out with no shame. It isn’t rare for him to let out long, loud snores during his nap. His tongue is CONSTANTLY hanging out while he walks around with his big Sammy smile. He likes to put his paws on Momma Karen’s shoulders and cha cha with her. He will dump his mushy tennis ball in your lap for a never-ending game of catch. There are endless laughs when he tries to chase the water spraying out of a hose. He’s always up for a good time, happy to play along with any game and amuse everyone with his goofy antics. He’s also very loyal and will stay by your side. He is the epitome of love and seems to be grateful everyday to be a part of “our pack”. He is the happiest dog we have ever met - full of energy, curious, playful, and above all, very loving! 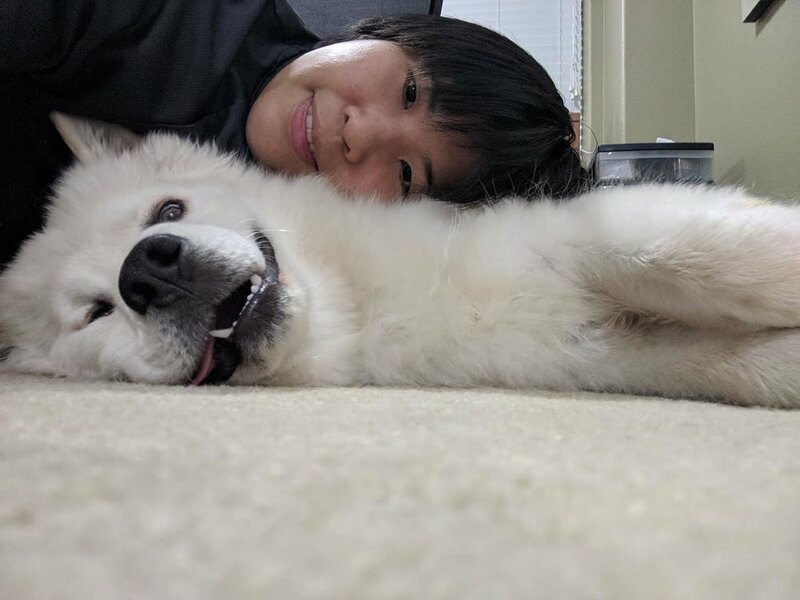 Lucky is a joy to have around because he is such a giant, fluffy goofball. He and Bentley are now the best of friends. The two boys have very different personalities but they compliment each other. They love being together and they love being in our home. We are thankful everyday for being given the opportunity to have Lucky as part of our family. His loving personality is the perfect addition to our home. 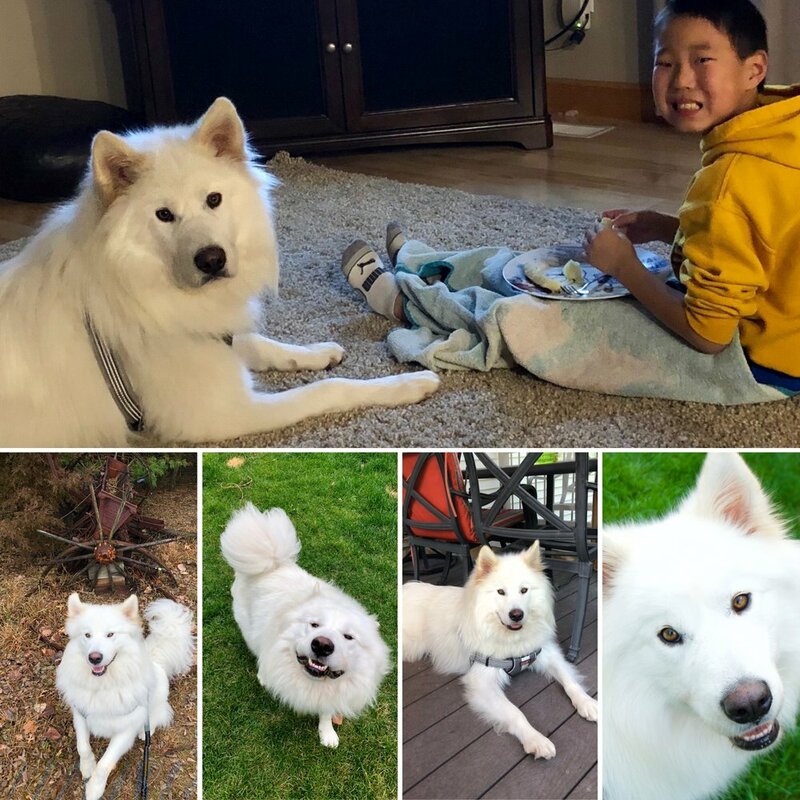 After losing our two Samoyeds, Ally in 2016 and Quincy in 2017 our decision was not to get another pet. Our friends in St George called us and told us about this little girl who was a couple years old and needed a new home. 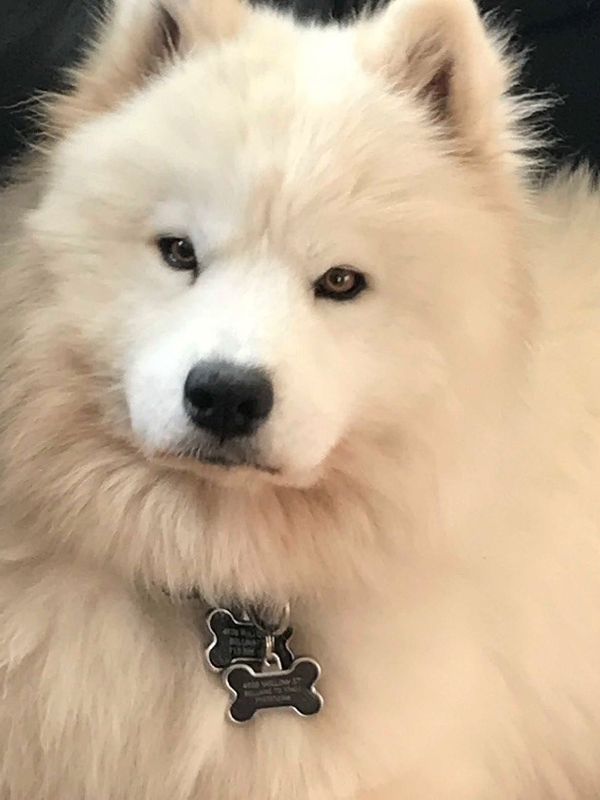 Of course Yvette starting sending pictures of this Samoyed to us and there was no way we could try to refuse to adopt her. On January 31st this beautiful little girl came flying in with Yvette to Chicago O’Hare and as soon as Yvette walked her out of the jet way we both fell in love with her. As many of you may have read on Yvette’s Facebook page Maggie was one of the 13 dogs rescued from a breeder in Wisconsin, none of the dogs were socialized or even knew how to play with toys. Yvette choose to give her to be fostered by Jeremy and Saya, with their patience and guidance they have brought her a long way socializing her with other dogs and showing her not to be afraid of people. She has been with us almost a year and she finally realizes that this is her forever home, and we are blessed to have her in our lives. She now enjoys long walks, going for long car rides and chasing those nasty squirrels taunting her and playing with the neighborhood dogs.